Oil-insulated neutral grounding resistors (ONR) and the series resistance devices for the neutral reactor (OSNR) development are completed with the collaborative research of the Tokyo Electric Power Co., Inc., Takaoka Electric Mfg. Co., Ltd. and our company. The production and the delivery of the product are also advanced favorably to electric power companies, the wholesale electric power companies and the comprehensive electrical machinery and appliances. 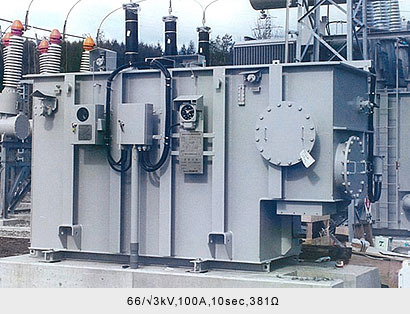 They became able to reduce installation space substantially to equipment with the pastshapes because they were made with shutting tightly structure including NGR, the disconnection container and the cable termination installed independently in the past. The reduction rate、became like 20.9% in the area and11.1% in capacity in 66kV and 200A rated items. The charging department was exposed in the conventional air insulation type, but in case of ONR and ONSR, they are equipment of higher safety because charging departments store allin the metal container of the earth electric potential. He resistors were made with the structure which were airtight perfectly in the electrical oil, and also made on the insulating strength oscillatory structure-less ness to lightning impulse and secured reliability as well as prevented degradation of oil by adopting the nitrogen sealing up system, making the structure with non maintenance and non inspection. It is examined at the factory in perfect assembly condition, and can be carried to local place as a whole, and installation can be done. Again, the substantial laborsaving with quick work and the spot examination are made possible by adopting cable head which cable connection with easy pre mold insulator. Other resistors for the electric power are as below.